This is a service for shipping small-lot freight and products from Europe, America and Asia to Japan. The Yamato Group provides total service in all phases from receipt until delivery. Packages are delivered by a Kuroneko Yamato sales driver. As of July 2013 International TA-Q-BIN provides service from the following countries. As of July 2013, the following forms of payment can be used for International TA-Q-BIN. Type of Payment Commodity Price Freight Import Duty, etc. Forms of payment marked with asterisk(*) can only be used by customers who have applied for International TA-Q-BIN Collect. Packages which exceed the size listed above are handled as Large-Sized International TA-Q-BIN. *If the size of the box (volume weight) is larger than the actual measured weight (actual weight), billing will be based on the volume weight. Also, depending on the market price for aircraft fuel, separate fluctuating charges such as a fuel surcharge may be incurred. If you like to send big volume parcel which exceed 25kg or 160cm, you can use Large-Sized TA-Q-BIN. It would be suitable for large furniture, household goods, electronic devices, and etc. A service providing advanced notification for shipping status, receipt time, payment amount and other information. The most frequently used form of payment for mail-order in Japan is COD (payment by cash at time of delivery). 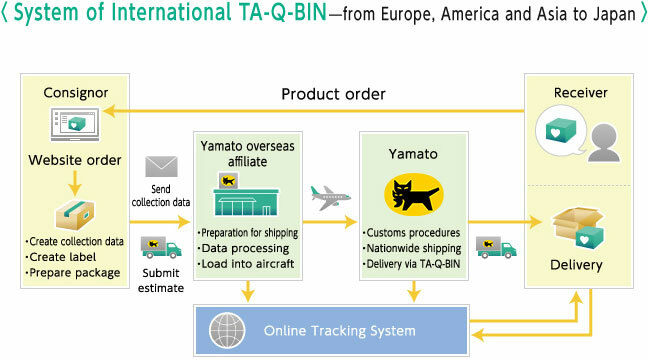 The COD service named "International TA-Q-BIN Collect" can also be used for mail-order goods shipped from overseas to Japan. Our collect service could increase your mail order sales. The product payment will be transferred to your bank account within 15 days in some cases. Please take advantage of this outstanding service. -An International TA-Q-BIN operating agreement must be signed in advance between your company and the Yamato subsidiary in the exporting country. -Yamato cannot handle products which violate our International TA-Q-BIN Terms & Conditions, laws and regulations of the applicable country, or public order/morals. -As a general rule, Yamato cannot handle dangerous goods. -Advance screening is necessary before implementing International TA-Q-BIN Collect. -When using International TA-Q-BIN Collect, payment at the delivery site can be made in cash only. -When using COD for freight and import duty, payment at the delivery site can be made in cash or e-money. Charges will be varied depending on the amount and frequency of items being shipped. We will issue an estimate. Please feel free to inquire. Yamato Global Logistics Japan promotes work-life balance for employees. Copyright (C) 2013 YAMATO GLOBAL LOGISTICS JAPAN CO.,LTD. All rights reserved.